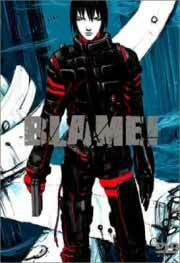 THEM Anime Reviews 4.0 - Blame! Notes: Based on the manga by Tsutomu Nihei, which ran from 1998 until 2003. An extra episode, entitled simply "Extra", was released with the series DVD, while a two-episode prequel simply entiled "Prologue" was made in 2007. Neither is covered in this review. Reportedly, the upcoming (as of 2014) second season of the series [b]Knights of Sidonia[/b], based on a manga by the same author and set in the same universe, will adapt [b]Blame[/b] as part of its story. Although I have not read the Blame! manga, I am aware that both it and its creator, Tsutomu Nihei, are well-regarded among fans of cyberpunk. Indeed, this series possesses the ghost of an interesting science fiction story, with its tale of a dying race living in an artificial world reminiscent of Pale Cocoon, Texhnolyze, and other such fascinating works, and I would be curious to know whether their respective creators were at all influenced by Nihei's style. Unfortunately, it is my opinion that the decision to adapt a ten-volume long manga into six five-minute-long episodes was an incredibly poor one. The Blame! anime is little more than a slapped-together series of barely-related and scantily animated images from the manga, with not an ounce of context provided. It falls into the worst possible trap that an "atmospheric" show can make, that of eschewing careful pacing, tension, and judicious placement of imagery, and the result is incomprehensible and interminably dull. Almost entirely devoid of actual animation, Blame! functions as an artbook for a story rather than a story itself, and while the art is finely detailed and certainly praiseworthy, I'd argue that one should simply read the manga if he or she wants to enjoy it, as I see no point in "animating" a series if you entirely fail to take advantage of the new medium. It is a poor excuse for an "experimental" tale, with as many strange pictures and dissonant pieces of music as you could want but no rhyme or reason to the images and no apparent significance to any of the endless panning of still paintings, which the entire first episode is wasted upon. Indeed, we see such oddities as colored projections of coelacanths moving along the corridors, an entire episode spent depicting a group of motionless, shadowy figures discussing the "network" that the human characters are attempting to access, and a sudden, bizarre cutaway to a man standing in a grassy field, but it all feels arbitrarily chosen, as if thrown in to create a guise of symbolism where there really is none. If any of this was at all important in the manga, it certainly wasn't carried over into the anime adaptation. The few "characters" present, in addition, entirely lack personality and have unclear motives, occasionally breaking the silence with such nonsense as "I am at the ultra pinnacle location of hard disk information" and leaving an already confused audience even more disoriented than before. While it is apparent that this world is ruled by so-called "silicon beings" (e.g. robots) and that humankind is on its last legs, I neither understood how this situation had come about nor particularly cared at series' end, and it was never clear to me what the characters sought to accomplish by finding a human with the gene, rendering the entire premise pointless. Again, the unfortunate choice of condensing this story into five minute snippets means that characters die or cease to be important before we've even established who they are, and the fact that whole episodes pass without any of them being seen doesn't help either. To say that the pacing is "glacial", meanwhile, is to make an understatement akin to saying that American politics are "a bit" dysfunctional. Watching this show plod along, unfortunately, is enough to (mistakenly) convince the uninitiated that the genre of experimental cinema consists entirely of pedantic drivel, as that is what this miserable little series is. I normally enjoy watching experimental works, but the Blame! anime is just the embodiment of everything that can go wrong while trying to make them. To be honest, I haven't been this bored while watching a series in a very long time, and I doubt that I would have been able to finish it had it not been as short as it was. The makers apparently forgot that the decision to experiment does not give one license to throw pacing, attention to character, and careful choice of images out the window, and in trying to tell an unconventional tale they just wound up making an insufferable mess instead. Recommended Audience: There is a small amount of bloodshed in the second episode, and several episodes are full of flashing lights that could potentially make an epileptic person have a seizure. I can't really say that this is especially inappropriate for children, meanwhile, although it really isn't geared towards them; they'll likely be even more bored than I was.